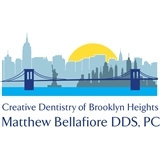 Matthew L. Bellafiore, DDS (Brooklyn) - Book Appointment Online! Are you ready to give yourself the gift of good health? Then you have come to the right dental office! Dr. Matthew Bellafiore and his skilled and compassionate dental team are here to help you attain your goals. We are not here to dictate to you – we are here to inform and inspire you. Your smile is one of your most precious resources and we want to help you bring your smile to life with our creative and skillful approach to dentistry. Our mission is to help each person achieve their most human potential through educating, inspiring and creating the possible. It is our intention as health care advisors to improve quality of life for each individual consistent with their wants, needs and values. We feel this can be accomplished by utilizing our care, skill and judgment based on sound principles of trust, understanding and appreciation. Dr. O'Connor and her team are wonderful and I would highly recommend her to everyone. Could not have been happier with my appointment.